From humble beginnings, Bartolomeo Scala (1430–1497) trained in the law and rose to prominence as a leading citizen of Florence, serving as secretary and treasurer to the Medicis and chancellor of the Guelf party before becoming first chancellor of Florence, a post he held for fifteen years. His palace in Borgo Pinti, modeled on classical designs, was emblematic of his achievements as a humanist as well as a public official. 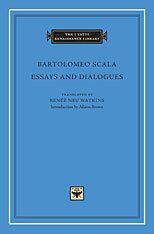 Along with his professional writings as chancellor, Scala’s personal treatises, fables, and dialogues—widely read and admired by his contemporaries—were deeply indebted to classical sources. This volume collects works from throughout his career that show his acquaintance with recently rediscovered ancient writers, whose works he had access to through the Medici libraries, and the influence of fellow humanists such as Marsilio Ficino, Aeneas Silvius Piccolomini (Pope Pius II), and Giovanni Pico della Mirandola. Perhaps the most significant is the Defense against the Detractors of Florence, a key document in the development of modern republicanism. 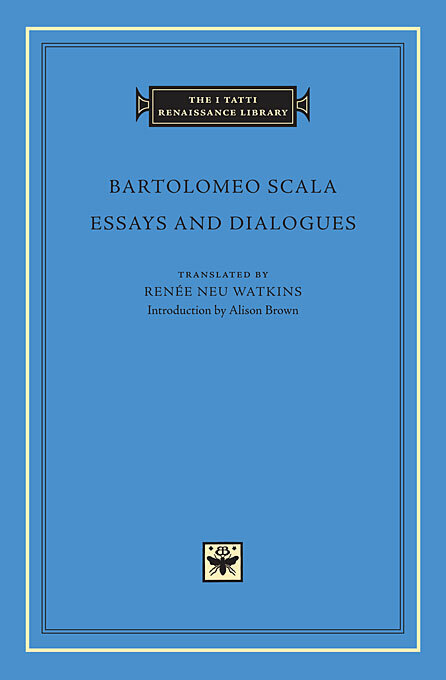 This volume presents fresh translations by Renée Neu Watkins of five of the texts based on Latin editions by Alison Brown, who also contributes an introduction to Scala’s life and works.